US futures are pointing to a higher open today after ending mixed on Wednesday. Investors are waiting to get a clarification on the steel and aluminium tariffs plan, which President Donald Trump would likely formalize later this week. The S&P futures advanced 0.28% to 2,731, Dow futures gained 0.15% to 24,832 and Nasdaq jumped 0.53% to 6,961.25. Elsewhere, shares at Asian markets closed mostly higher on Thursday, and European stocks are trading higher. On the European economic front, data from Destatis showed that Germany’s new factory orders fell 3.9% on month in January after rising 3% in December. The Bank of France expects France’s economy to grow at a slower pace and maintained its growth forecast at 0.4% for the first quarter, compared to the 0.6% increase seen in the fourth quarter. The Hungarian Central Statistical Office data showed that Hungary’s consumer price inflation slowed to 1.9% in February from 2.1% in January. Data from the State Secretariat for Economic Affairs revealed that Switzerland’s unemployment rate fell to a seasonally adjusted 2.9% in February from 3% in January. The Central Bureau of Statistics data revealed that Dutch consumer price inflation eased to 1.2% in February from 1.5% in January. On the Asian economic front, data from the Cabinet Office showed that Japan’s gross domestic product rose 0.4% in the fourth quarter of 2017 after rising 0.6% in the third quarter. The General Administration of Customs data showed that China’s exports climbed 44.5% on year in February, imports jumped 6.3% and trade surplus was $33.74 billion in February. 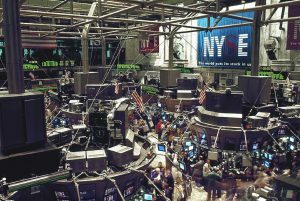 On March 7, US ended mixed, with Nasdaq up 0.3% to 7,396.65, while Dow was down 0.3% to 24,801.36. S&P 500 declined 0.1% to 2,726.80. The Advanced Data Processing data showed that employment in the private sector jumped by 235,000 jobs in February after rising by a revised 244,000 jobs in January. The Commerce Department data revealed that trade deficit widened to $56.6 billion in January from $53.9 billion in December. Meanwhile, key economic data that will be released today include the Labor Department’s weekly jobless claims, Challenger job-cut report, and Energy Information Administration natural gas report. The auction of treasury’s 3-year and 10-year note and 30-year bond will be held today. The Federal Reserve’s money supply data and balance sheet will also be the focus by the Wall Street. On the corporate front, Express Scripts Holding stock jumped 17.47% premarket after Cigna announced plans to buy Express Scripts for $67 billion. Burlington Stores stock climbed 9.58% in premarket after upbeat fourth quarter earnings. Costco Wholesale stock slid 0.25% in premarket after dismal second quarter earnings. Kroger stock fell 5.87% in premarket after in line fourth quarter earnings. Express Scripts Holding stock jumped 17.47% premarket after CIGNA announced plans to buy Express Scripts for $67 billion. On the earnings front, Christopher & Banks, Stage Stores, NII Holdings, Curis, American Eagle Outfitters, Tech Data, Kopin, International Game Technology, United Natural Foods, Marcus & Millichap, Marvell Technology, and Universal Technical Institute are the key companies due to release their earnings today. Crude oil futures is down 0.08% to $61.10. Gold is trading down 0.11% to $1,326.10, while silver is up 0.04% to $16.50. On the currency front, the US dollar is trading up 0.07% at 106.182 yen. Against the euro, the dollar is up 0.07% to $1.2419. Against the pound, the dollar is down 0.12% to $1.3885.